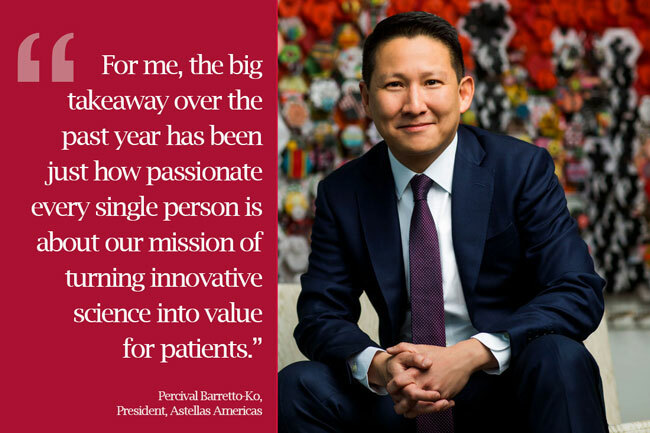 A year after being appointed Astellas Americas President, Percival Barretto-Ko recently shared his day-to-day experience in his role as well as some of the key focus areas that are critical to the future of Astellas and the biopharmaceutical sector: bridging the gap between access and innovation, defining value, and the importance of diversity and inclusion, just to name a few. Below are excerpts from the recent conversation, as well as a brief video clip. Q: Tell us about your experience serving as Astellas Americas President. I am proud of the Astellas organization, the culture that we’ve built, the people that we have. Without question, we have some of the top people in the industry who are passionate about what they do and the impact we have on patients. For me, the big takeaway over the past year has been just how passionate every single person is about our mission of turning innovative science into value for patients. It truly sets Astellas apart as a company that always follows the science wherever it leads us. Q. We’ve heard you talk about the link between access and innovation and why it’s so critical in delivering value. How would you say that those two are connected? Innovation is central to who we are. We pride ourselves in developing new medicines for some of the most difficult-to-treat diseases. But, at the end of the day, innovation needs to be translated into true access for patients. Therefore, while it’s important that we continue to support and protect innovation, we need to ensure that the innovation gets to the right patients, at the right time. We can do this by incorporating the patient voice in all that we do. In doing so, the pursuit of science only stands to benefit because innovation is translated to true value – and serves the needs of patients. Q. Can you speak further to some of the access challenges that patients face? I am proud of the groundbreaking innovation behind life-saving medicines that have been invented and developed in recent years. These therapies have helped address patients’ needs and, as an industry, we should be proud of our contributions to society. That said, while innovation of these transformative products has skyrocketed, the financial burden and out-of-pocket costs for patients has also risen. Simply put, the way these products are reimbursed has not evolved at the same clip, and prescription drug benefit plans have not adapted to scientific innovation. This has a real impact on patients and their ability to access the medicines they need. For example, we know that as out-of-pocket costs rise, abandonment rates of treatments by patients also rise. This directly affects their outcomes. This is not acceptable. Therefore, we need to evolve how the reimbursement system works to catch up with the rise of innovative therapies. Q. You have talked about the importance of having more diversity and inclusion in the industry – including in clinical trials. Why is this so critical? For us to truly serve the needs of the patient, we should appropriately represent and reflect the communities where we live and work. As a result, diversity and inclusion (or D&I) is a key strategic priority for Astellas. D&I enables us to look into what we believe and who we are as a company. It involves far more than just creating employee resource groups. It’s a way of thinking. For instance, historically a lack of diversity in clinical trials has led to data that may not be reflective of a broad cross section of society. By ensuring that enrollment in clinical trials is reflective of the potential patient population, we are able to appropriately generate data that will serve patients well down the road. This, in turn, helps us erode existing disparities in health care, and takes us one step further toward addressing the needs of patients. As someone who was born and raised in the Philippines to a Korean mother and a Filipino-Chinese father, I’m acutely aware that, often times, my own identity is not reflected in the clinical trials that are held day in and day out across the world. This is personal for me. Q. What does the healthcare system look like 10 years from now? What role will innovation play? Without question, the future of the healthcare system will continue to focus on value, and how innovative therapies in the pipeline are translated into access for patients. As a result, we must continue to have a tenacious, singular focus on patients, what they value most, and their holistic healthcare journey. In addition, I am hopeful for a more diverse and inclusive industry that reflects the societies we serve. If we indeed wish to continue to play a relevant and positive force for good in society, it is critical that we continue to build a culture of belongingness, and that we serve the needs of all patients. I’m honored to be a part of helping to make it possible.